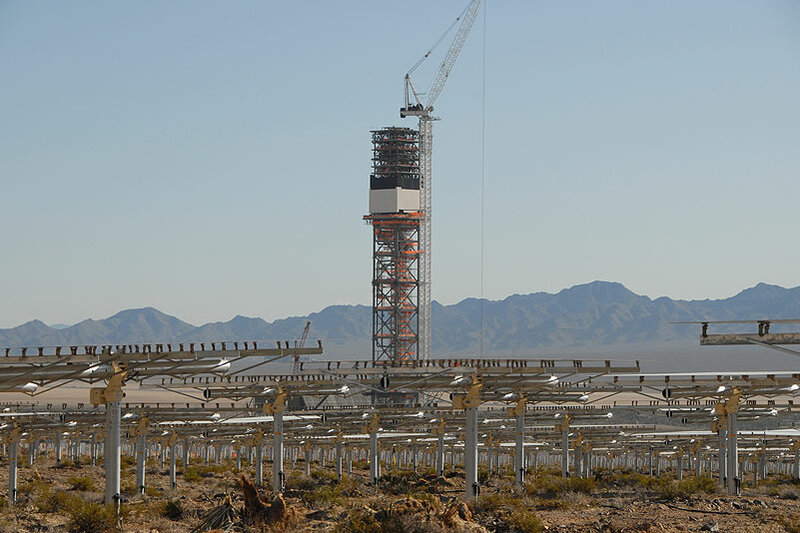 BrightSource’s 370-megawatt facility near Las Vegas is taking shape, but the future of solar thermal is much more fuzzy. 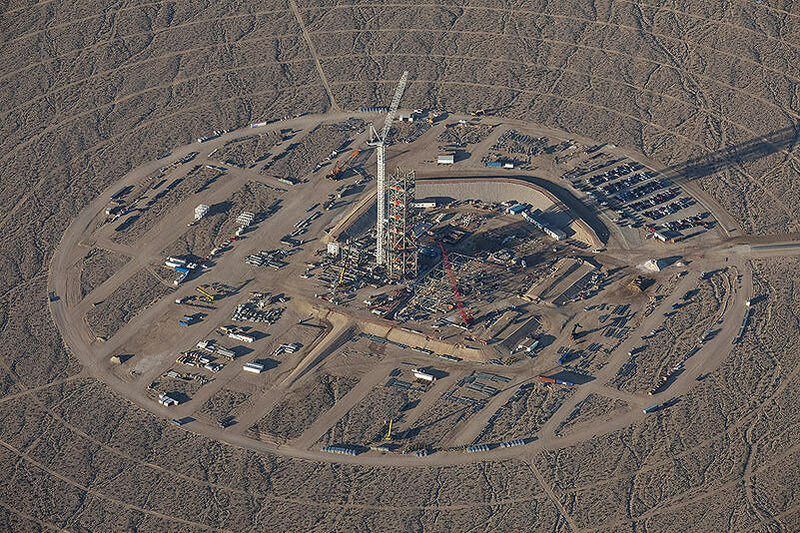 The outlines of a massive solar thermal power plant—the largest ever—are starting to appear in the wilderness outside of Las Vegas. 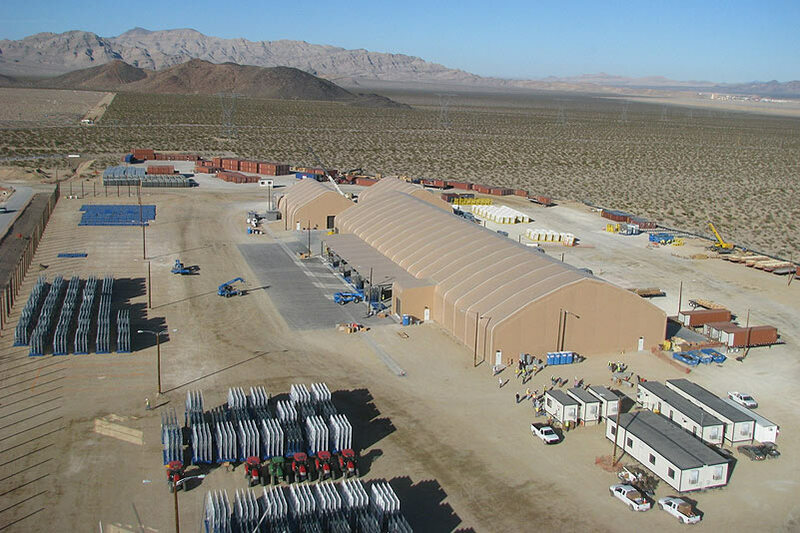 The $2.2 billion project, which is being built by Oakland, California-based BrightSource, stretches over 3,600 acres near Ivanpah, California. 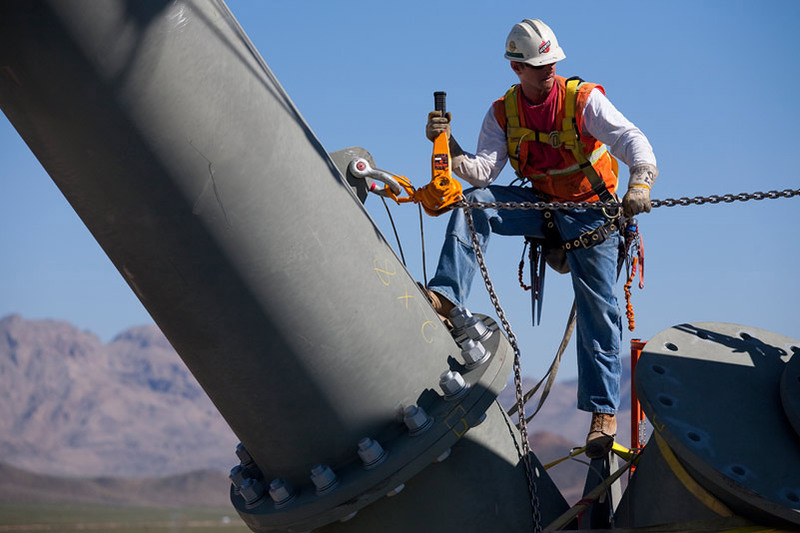 When it’s finished, it will generate 370 megawatts of electricity on sunny days. 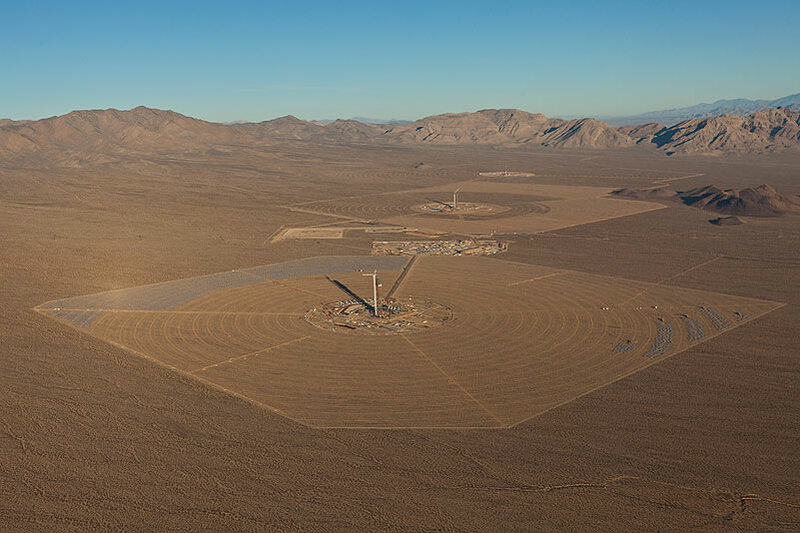 The Ivanpah solar thermal plant uses concentric circles of mirrors that will focus sunlight onto a central tower, generating high temperatures to produce steam. The plant will feature three towers, each with its own set of mirrors. The first unit, in the foreground, is the nearest to completion. By February of this year, workers had begun to install mirrors, which can be seen in the upper left and right sides of the field. By November 2011, the first tower was under construction. Last summer, a worker installed one of the large cylindrical support structures for the power tower. BrightSource found a surprising number of desert tortoises at the Ivanpah site. Biologists have collected the tortoises and are relocating and monitoring them. 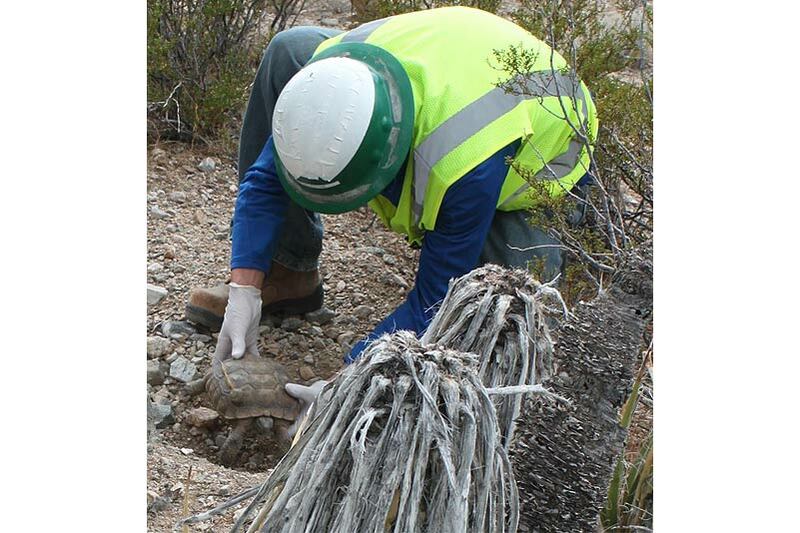 This image shows one of those workers in September of last year placing a tortoise near a new burrow outside the Ivanpah site. 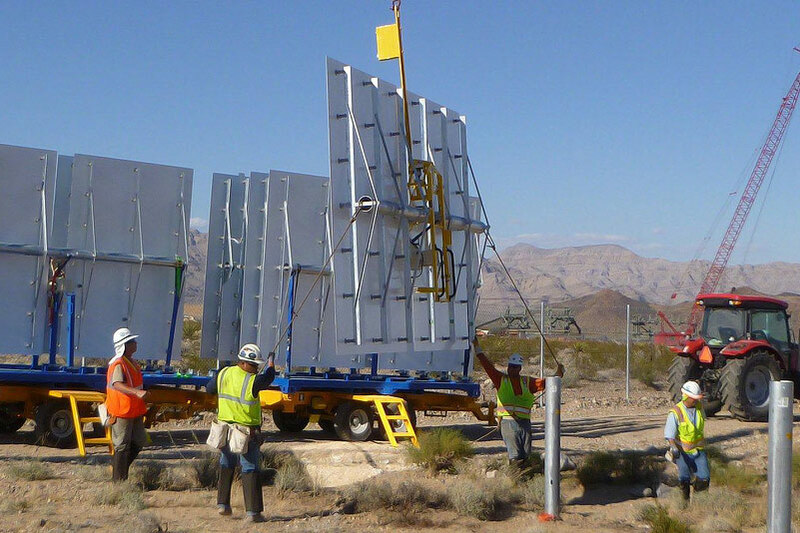 BrightSource has constructed a temporary factory on-site for assembling mirrors into heliostats, which track the movement of the sun, keeping light focused on the same spot all day. Inside the factory, mirrors are positioned by robots and conveyed along tracks, while workers bolt them to metal frames and the motors that will allow the mirrors to turn to follow the sun. 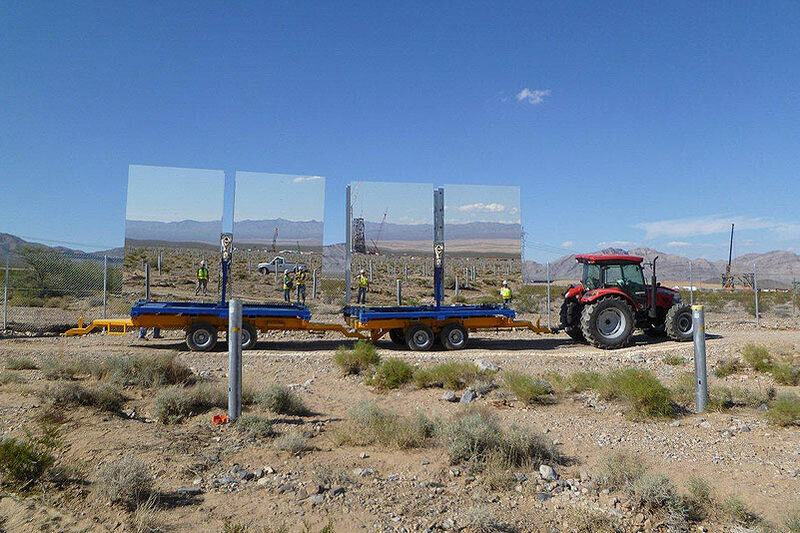 Once they’re completed, heliostats are pulled out to the mirror field with tractors. In the foreground, and reflected in the mirrors, are the posts they will be mounted to. Workers use cranes to mount the heliostats. The posts are pounded into the desert floor—rather than being anchored to concrete foundations—to limit their footprint. By February of this year, the first tower had reached its full height of 459 feet. The mirrors in the foreground are kept in a horizontal position when not in use so they won’t catch the wind. The project has been a long time coming. BrightSource first filed an application for the project in the summer of 2007. Approval took three years. Construction was temporarily slowed to accommodate the care and relocation of desert tortoises—a threatened species—found in larger numbers than expected. The project, which will generate electricity by using mirrors to concentrate sunlight to heat up water and drive steam turbines, is now expected to be finished next year. Even as the project nears completion, the future of solar thermal power plants is in doubt. That’s in large part because prices for solar panels—which convert sunlight to electricity directly—have dropped quickly in the last few years, causing at least one company to abandon plans to build solar thermal plants in favor of making ones that use solar panels. Yet solar thermal has at least one great strength compared to many other types of solar power: the heat it produces is easy to store, so electricity can be generated even after the sun goes down, and power can be dispatched to the grid whenever it’s most needed.